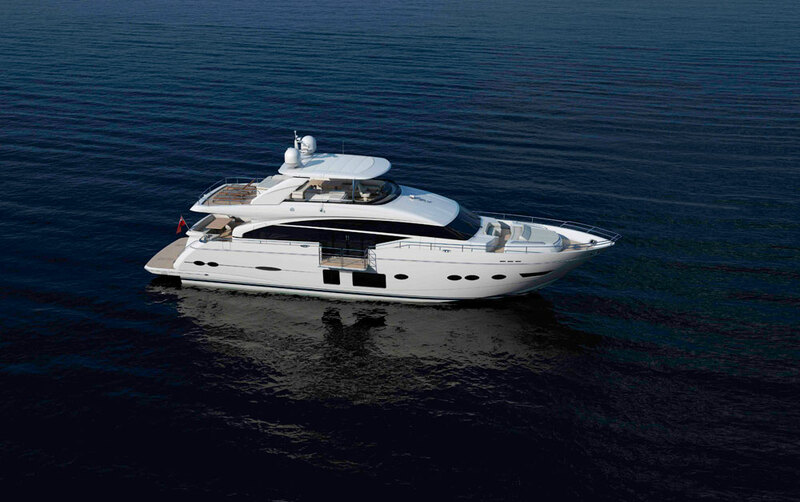 Alex Smith gets a first look at the latest entry in the Princess Flybridge Motoryacht range. Launched almost a year ago, the prolific Princess yard dubbed the new Princess 88 as a yacht designed to epitomise “everything that is Princess”. 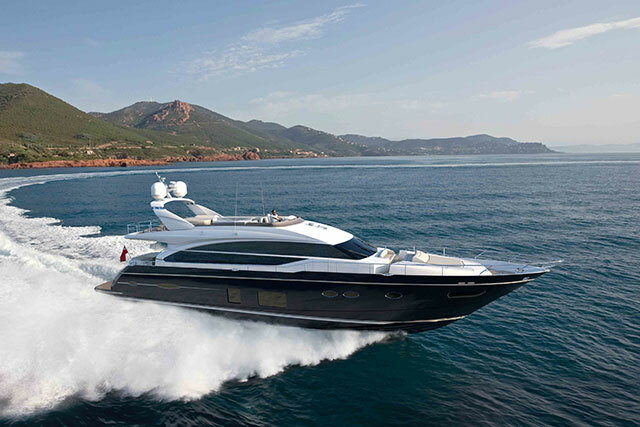 The Princess 88 is now the second largest of the British builder’s nine-strong Flybridge Motoryacht line. Internal luxury and dynamic efficiency will once again be put firmly at the top of the priority list, alongside a fit-out designed to feel powerfully bespoke. Certainly, it’s a recipe that has been very successful for the brand’s large luxury cruisers and with nearly 100,000 square metres of space at its HQ in Plymouth and a current fleet of 23 craft across four product lines, the Princess yard certainly remains well placed to repeat that trick. The last couple of years also suggest that the world’s boating press and awards panels will be quick to appreciate this approach. Princess has been as active with its product development in this sector as any brand in the world and its new launches have frequently been lavished with superlatives. 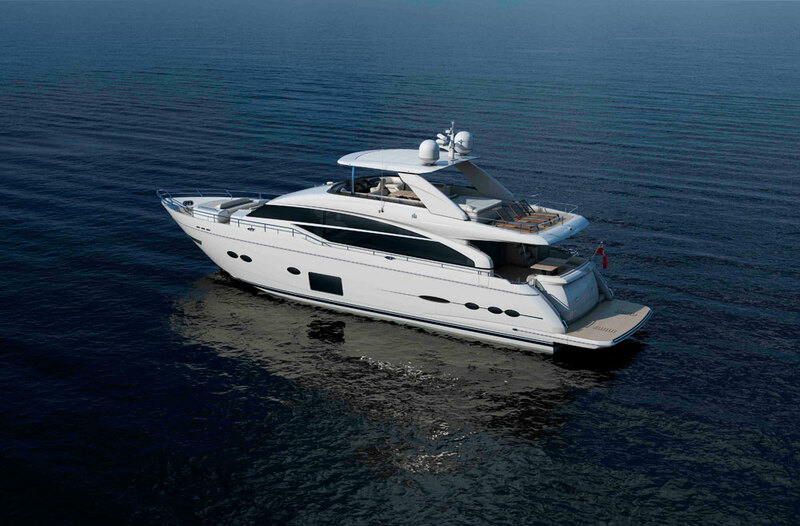 Naturally then, as the second largest in the well established Flybridge Motoryacht range, the 88 is by no means attempting to reinvent the wheel. Instead, it takes the proven (and well appreciated) formula for an effective long-distance luxury cruiser and adds a couple of significant new features. 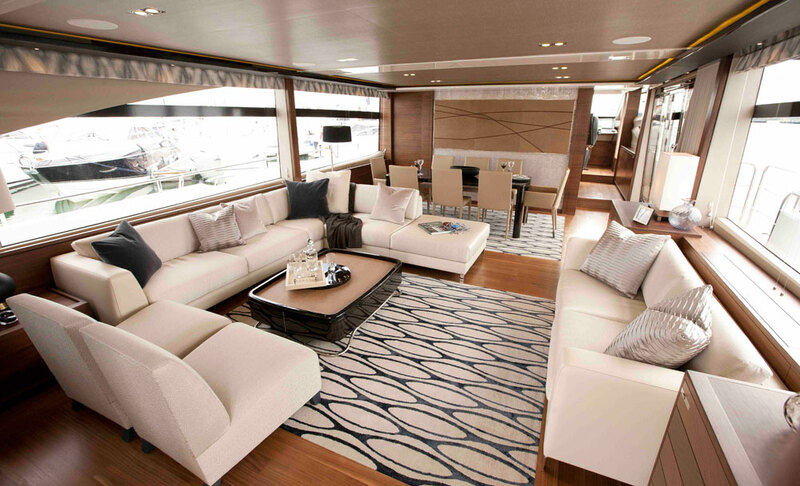 The open plan saloon is the highlight of a very effective main deck. As a long-range cruising craft, the internal design is supposed to be as versatile as possible and on the main deck that means four very distinct but complementary sections. 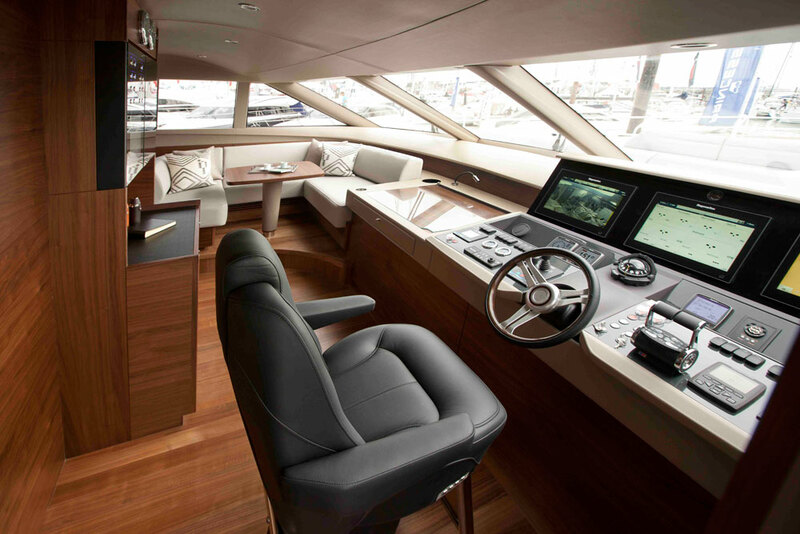 Starting at the aft end, the cockpit provides a broad C-shaped dining area opposite an external bar, plus shelter from the flybridge and a large tender garage opening onto the swim platform below. Ahead of this, the open-plan saloon offers a huge seating space to relax, plus a dining area further forward, all bathed in light from those vast, full-length panoramic windows. The helm section hides the galley round behind the port lounge. 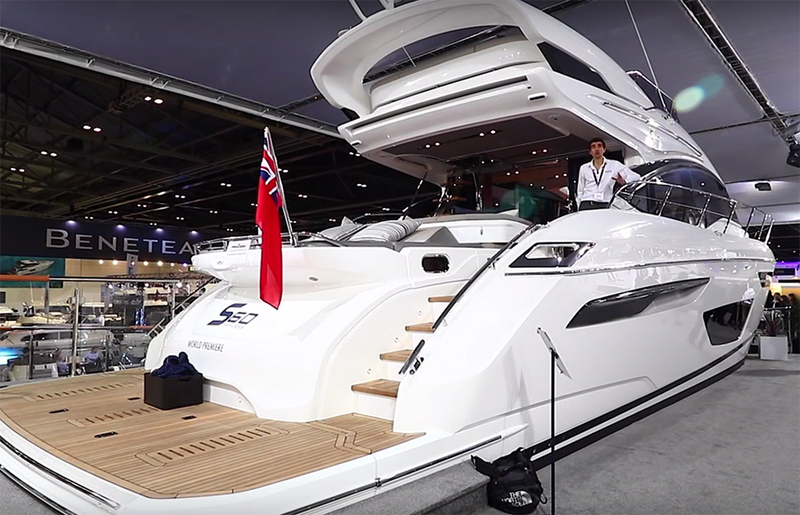 Step forward again and the helm station also feels like an impressively inclusive spot, with a dedicated seating area to port of the dash, a small heads and a very space-efficient galley with a pair of opposing L-shaped work surfaces. On the face of it, the location of the galley, tucked around the corner to port makes it seem rather cut-off, but any problems brought about by this deliberate separation of the inglorious work space from the serene gentility of the main guest area are overcome by means of crew access from the side decks. 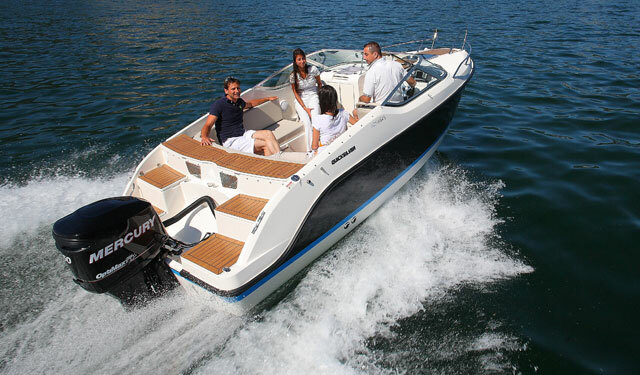 It is particularly notable, however, that the 88 also makes excellent use of the foredeck. Here, a forward-facing C-shaped seating unit sits across from a bench and a large sun pad – and this is all linked to the forepeak workstation and the entertainment area of the aft deck via a pair of usefully broad and uncluttered external walkways. 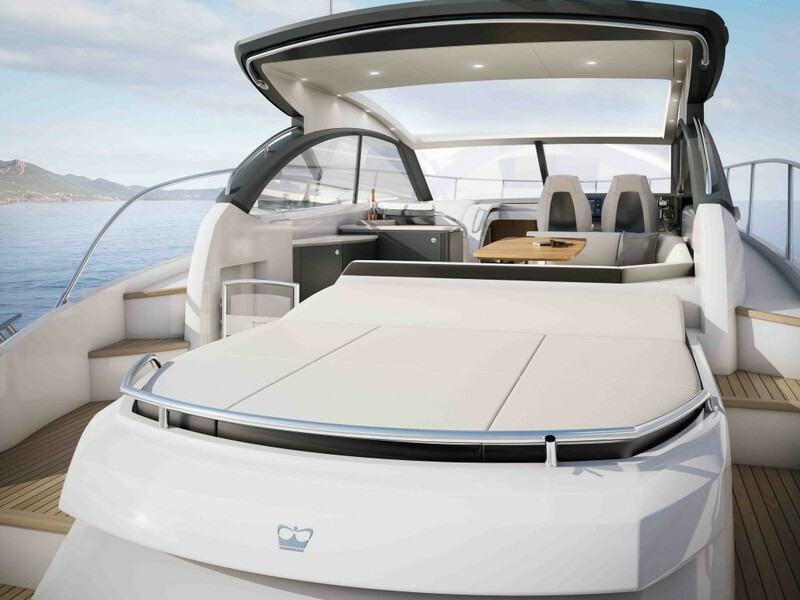 To make matters even better, for the first time on a Princess of this size, the 88 even features an optional powered balcony which folds neatly out from the starboard side deck, connecting the saloon with the outside world through sliding glass doors. 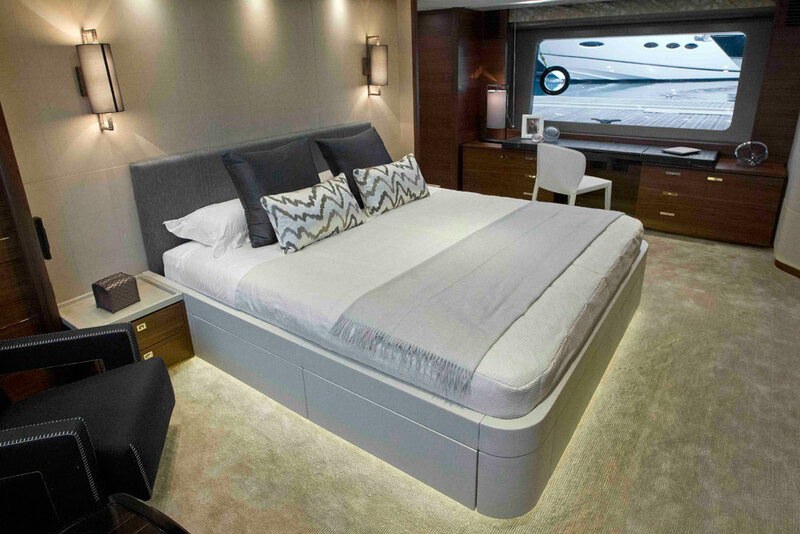 Now plainly, an 88-foot motor yacht with a 21-foot beam has a fair bit of space at its disposal, but it is good to see that even the smallest areas are attended to in a proactive and design-sensitive way. 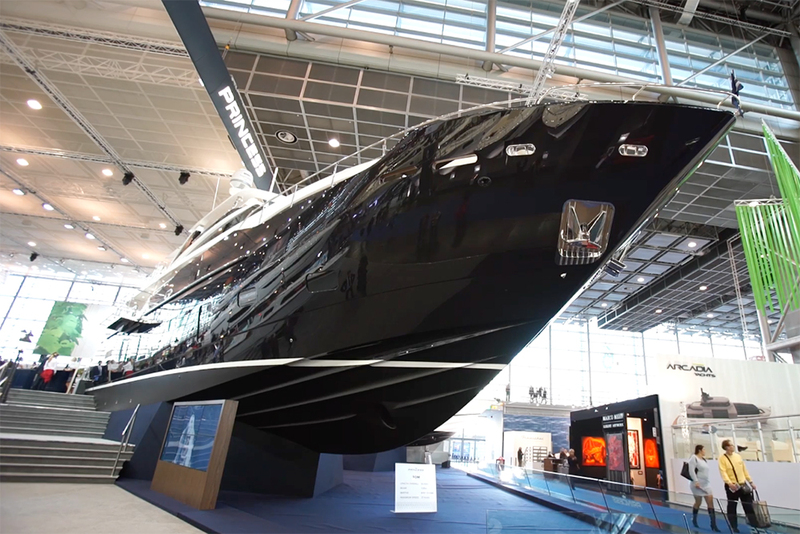 The starboard balcony is a big bonus on a boat of this size. 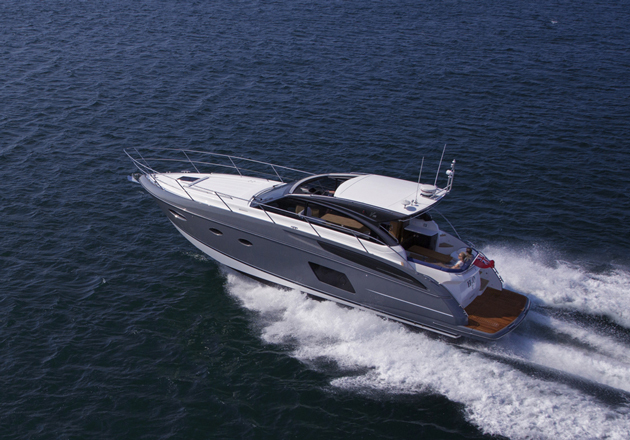 Up on the top deck, in addition to a fully featured second helm, the flybridge offers a full armoury of sunpads and a large dining area with wet-bar facilities, plus seating on either side of the twin helm seats to help keep the pilot properly involved. There is no internal stairwell to bring you directly up from the saloon, so instead you have to clamber up the external flight on the starboard side of the aft cockpit. However, these steps are pretty secure and sheltered and such are the facilities of the top deck that there should be no need to spend your time ferrying stuff up and down. Simply stock up, settle in and this self-sufficient top deck will enable you to stay put for as long as you like. The Master Cabin can be split to provide a five-cabin layout. Down below, the standard layout provides a master suite amidships, with a forward VIP stateroom, a starboard double to starboard and a twin cabin to port. All are equipped with en-suite shower rooms but in this four-cabin format, it’s the full-beam master that really stands out, with an extraordinarily well-appointed space comprising an enormous bathroom, a dressing area and a private breakfast table. However, bright, spacious and delightfully indulgent though it undoubtedly is, the optional five-deck arrangement looks like a very useful alternative, particularly for large groups and charter purposes. It basically takes the same layout but splits the central master suite into a pair of smaller double cabins, each with a single porthole and a reduced aft section for the en-suite facilities. In accordance with established doctrine, the crewmembers are accommodated aft of the machinery space. However, in the 88, this section of the boat is by no means an afterthought. On the contrary, it provides a Captain’s double cabin, a twin cabin and a crew mess area, plus sufficient versatility to specify an optional three-cabin layout if that better suits your purposes. 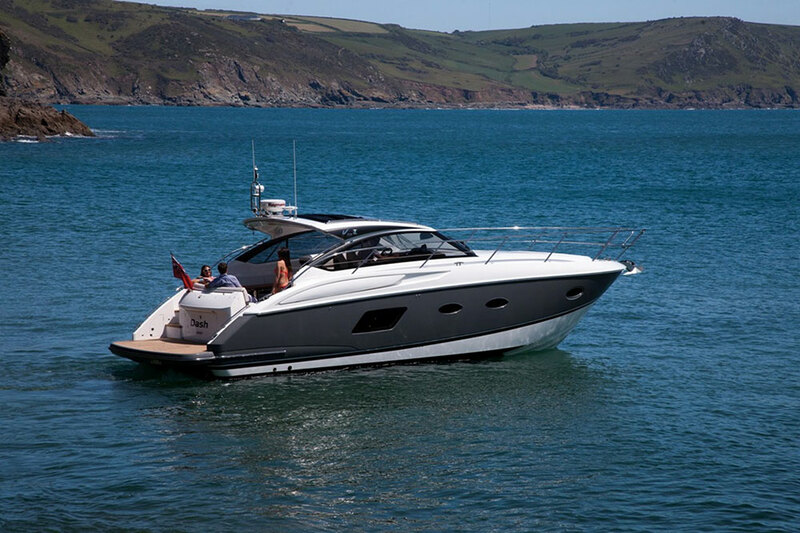 With the aft sunbathing area on the flybridge, a generous C-shaped dining area on the main deck, an extremely well appointed bow area, unbroken wraparound walkways and a starboard balcony, it is difficult to fault the external spaces on the 88. It is equally difficult to fault the quality (or the intrinsic appeal of the proprietary designs) of the internals. With two major internal layout options, plus three engine options and a range of individual upgrade routes, this 30-knot flybridge motoryacht looks like another sage move from the prolific Princess stable and a worthwhile addition to the fleet. For more flybridge motoryacht reviews, see: Brioni 44 review: a striking delight and Sunseeker Portofino 40: A memorable debut.